I recently took a day and put together several No Sew Fleece Blanket Kits. Before starting I thought to myself, oh boy, this is going to be 1. very time-consuming and 2. very difficult for a very un-crafty person such as myself. What unfolded throughout the morning was a very pleasant surprise. I found that putting together the blankets was a very simple, easy to do, process. Anyone can really do this. If you have purchased a kit and aren’t quite sure if you can or how to put it together here are some easy to follow directions. 1. 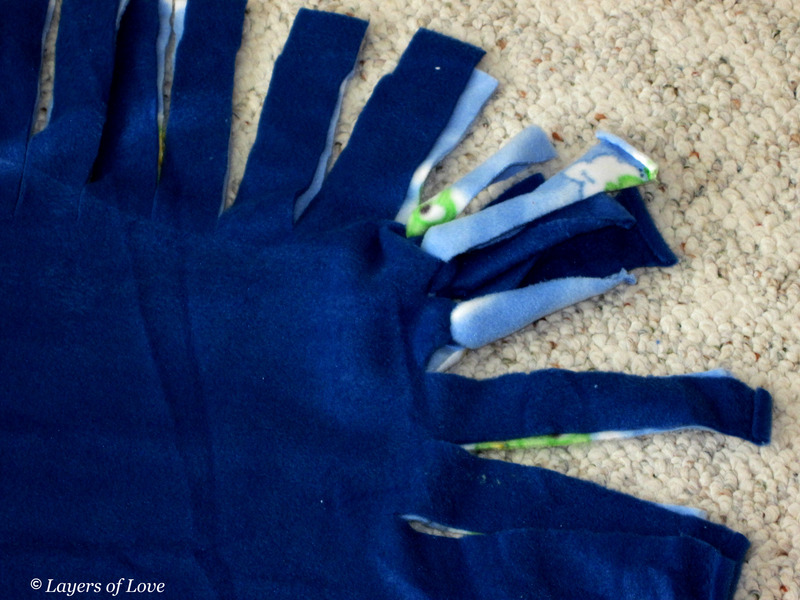 Open up the blanket kit, lay out both pieces of fabric one right on top of the other. 2. The directions on the kit call for cutting out 7 inch squares on each corner. Being the type of person who likes to live on the edge, I did not measure. I just cut the square big enough to allow the strips of fabric to be knotted together. Once I had one square-cut, I used that first cut out square as a template on the other 3 corners. 3. 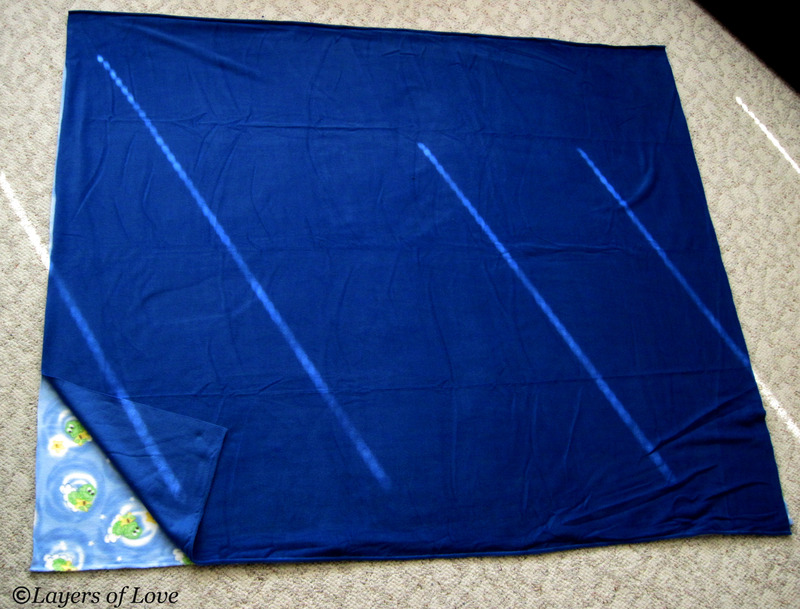 Here is a look at the blanket kit with all four corners cut out. 4. 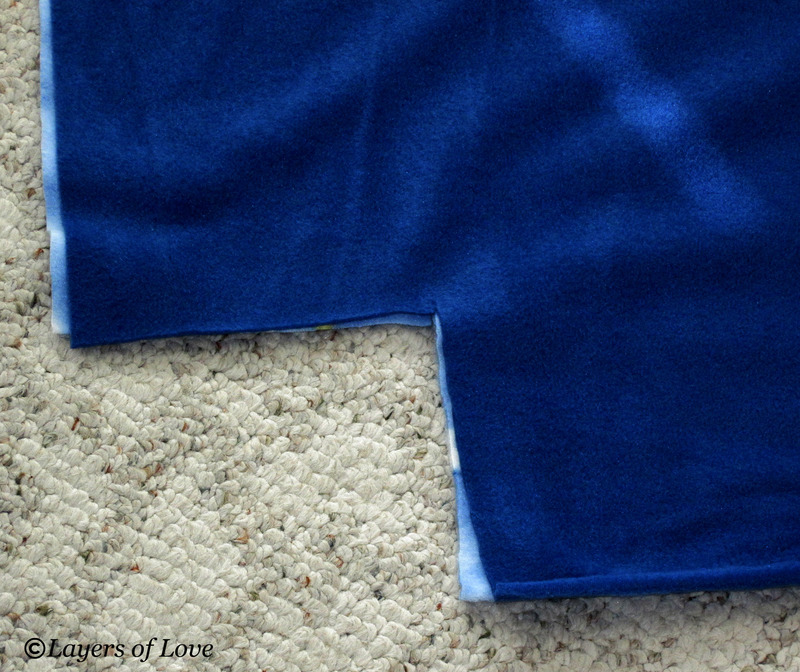 After all four corners are cut out you can begin cutting the 1 inch strips out along all four sides of the blanket. Once again I was living on the edge, just did this by my eye without measuring. 5. 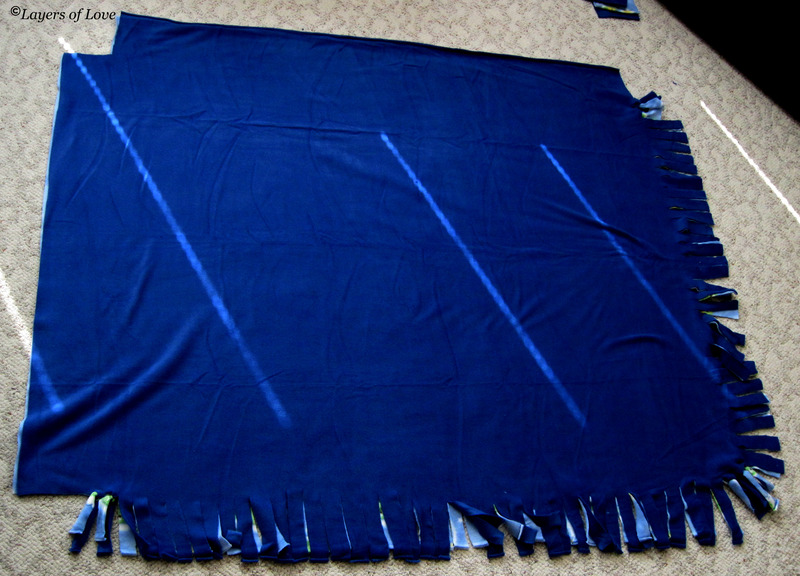 Once I had two sides all cut I started to knot the blanket. I only knotted the corners. The reason I did this was so when I picked up the blanket to knot all the sides, the two pieces of fabric would stay matched up together, that way I wouldn’t have to sit on the floor to do the knotting. 6. Here is a view of the corners knotted. I found that knotting 2-4 strips of fabric on the corners holds the two pieces of fabric together nicely. 7. 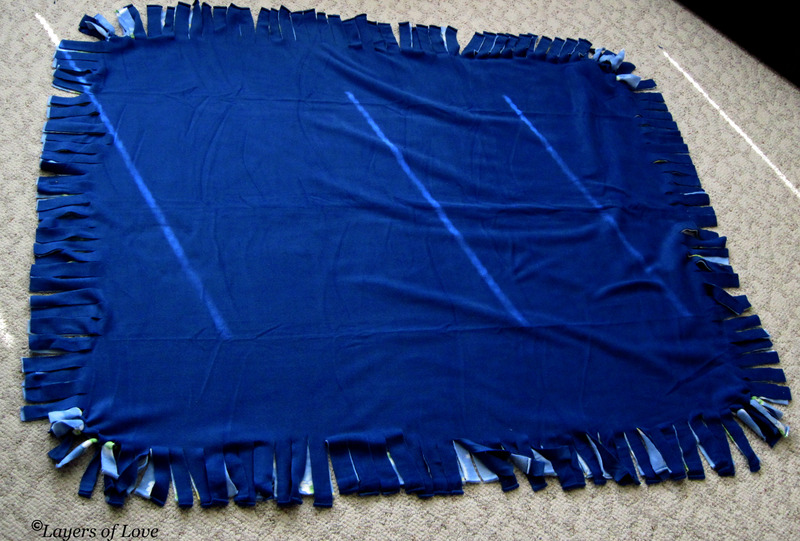 The blanket with all four sides cut out, corners only knotted and ready to be completely knotted. As I mentioned before, you don’t have to continue on the floor, with all four corners knotted you can move yourself and the blanket to a more comfortable position on a chair to continue knotting all four sides. 8. 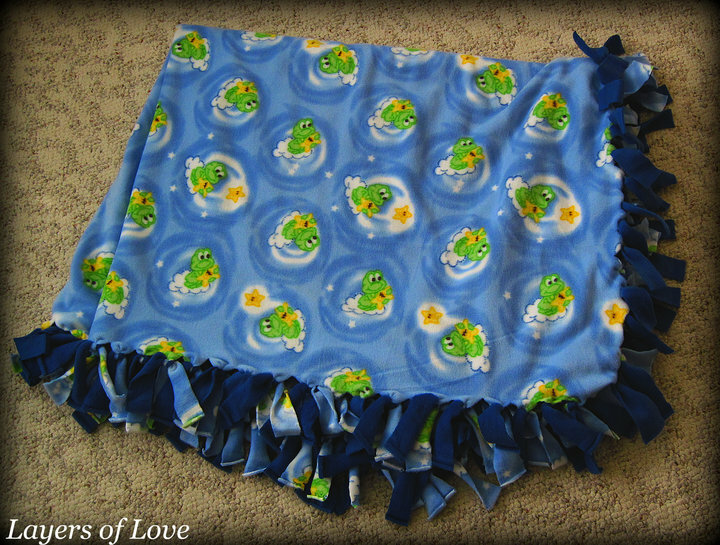 Here is the finished No Sew Fleece Blanket Kit. 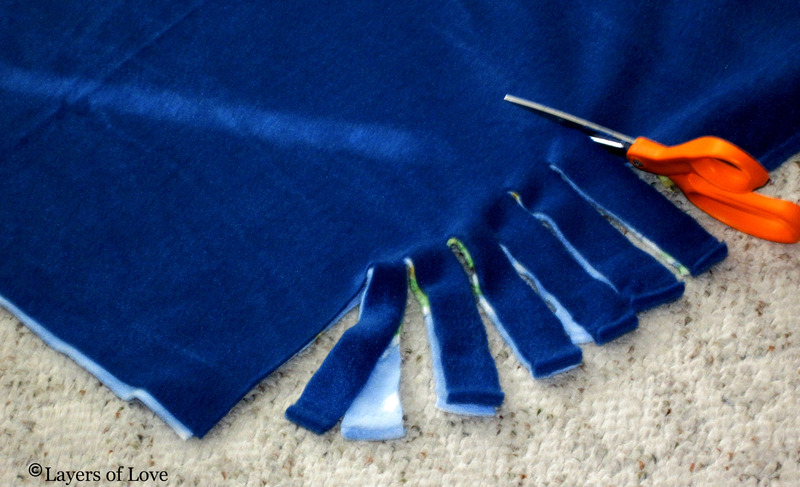 Make sure you have sharp scissors, remember you are cutting through two pieces of fleece fabric at once. 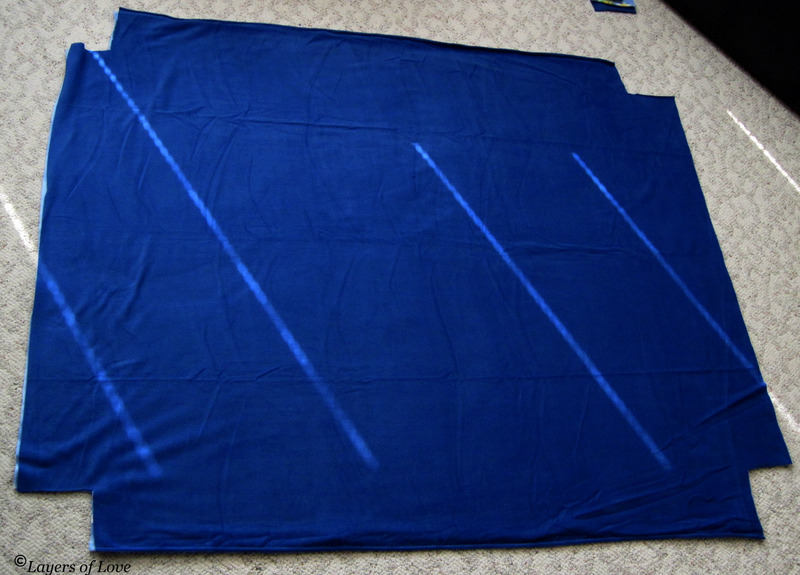 Make sure you have a big enough space to lay out your fabric, remember they are 72 inches long. If you make a mistake cutting, ie. one strip longer than the other, one square not exact to the other three, don’t sweat it. This is a homemade project, what you might notice, no one else will. It’s the imperfections in your work that essentially make it your own and perfect to others. Set aside about 35 minutes to an hour for your blanket kit from start to finish. My first blanket kit (of course) took me longer to complete, probably around 50 minutes from start to finish. By the time I moved on to my third and fourth blanket kit, I was down to about 35 minutes from start to finish. As with any project, you get into a groove and work in a manner that works for you. I work best with music. Before I started putting together the blanket kit I turned on my stereo and some of my favorite music. It helped me to relax and enjoy the process. If you have put together your own blankets, let us know your tips. What worked best for you? Make sure you snap some photographs, we would love to share your experience here on our blog! This entry was posted in Donations, Uncategorized and tagged blanket kits, Donations, easy, enjoyable, fleece blankets, helping, homemade, simple. Bookmark the permalink. That is fantastic! We are just getting settled and very excited to be in this area. Glad you are going to give it a try, we appreciate your generosity. If you have any questions please don’t hesitate to let us know. I’ve been working on my blanket for more than three hours. I have the four squares cut out and one side cut and knotted and one side cut – no knots yet. What am I doing wrong? Also my knots don’t look neat even though I’m tying them the same way some of the knots have the smooth side up and some don’t. Why is this? If I’m tying them the same way, in the same direction shouldn’t they all come out the same? There is no set time when your blanket should be completed, we have found over the past few years that everyone works differently to complete their blankets. We have had community groups and individuals take days to complete blankets and on the flip-side, some groups have completed many blankets within hours. It really just depends on the individuals who are doing the work. So don’t worry how long it takes you, just work at your own pace.